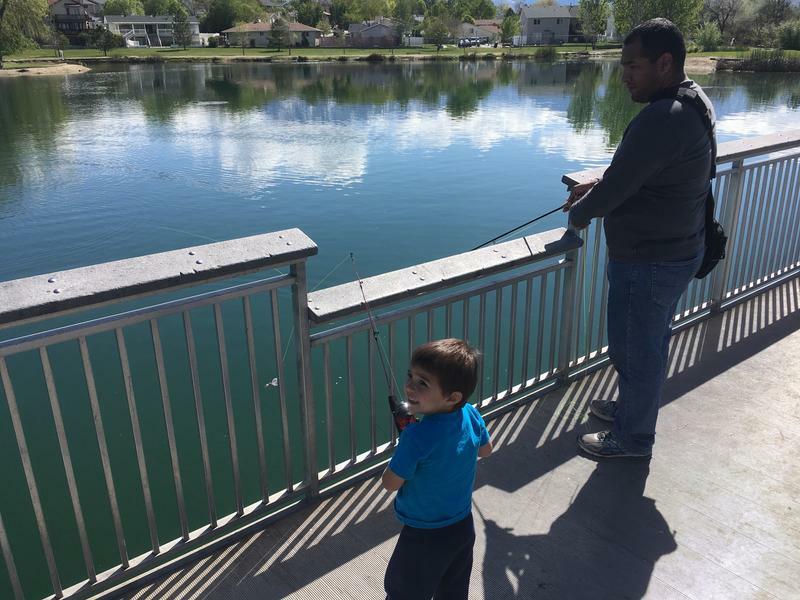 Antonio Cadena and his son, Daniel, fishing at Willow Pond Park in a suburb of Salt Lake City. It's an urban park filled with birds and - after the stocking - hungry Rainbow trout. Aquaulturist Ryan Arthur of the Utah Division of Wildlife Resources stocks Willow Pond Park in Murray, Utah. A small crowd watches as he unloads around 1400 Rainbow trout into one of Utah's community fishing ponds. Great blue herons stand sentinel as a pair of pelicans lounge near the pond's edge. They seem oblivious to the racket from the highway nearby. So does Antonio Cadena. He’s fly-casting. His son, Daniel, 2, is giving his toddler-sized spin-casting rig a break. “Daniel, do you like catching fish?” his father asks. “Big ones, Dad,” Daniel responds. The two spend a few mornings a week here. Willow Pond in Murray, Utah, is like community fishing holes around the West. They’re stocked to draw friends and families, and to get people outside for some fun. “I just want to make sure he gets outdoors and he doesn’t grow up just watching TV all day, every day,” says Cadena. “He comes out here. He’ll run around. He’ll play with the ducks, and he’ll chase ‘em. And when we occasionally catch a fish or two, he likes to touch ‘em and throw ‘em back." Or maybe take the fish home, simmer them in garlic butter and eat them. “I think it’s good for him,” Cadena says. It’s a sparkling spring day, and the Wasatch Mountains are a grand backdrop beyond the Salt Lake Valley. The grass and trees here are greening up. A few men huddle in the shade, coffee cups in hand. One is Jerry Weaver, who comes here most days. They talk about fishing when they were kids, how they’d spend long summer days outdoors, how their dads taught them how to fish. They refurbish fishing poles from the thrift store and use them to teach kids who want to learn to fish. They call it “giving back” — but they get a kick out of it. But they also look forward to stocking days – like the one about to happen. They’re watching a boxy truck roll up. There’s a huge trout painted on the side. Inside are thousands of rainbow trout from the state hatchery. 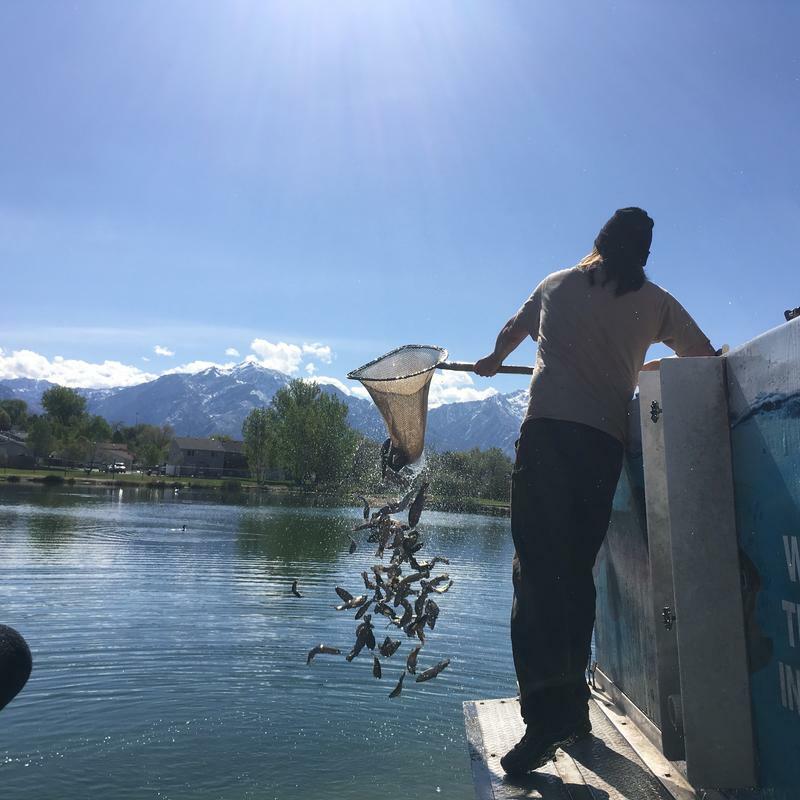 “I’m going to put about 1,400 fish into the pond,” says Ryan Arthur, an aquaculturist for the Utah Division of Wildlife Resources. A small crowd watches as he climbs onto the truck’s side and dunks a big net into a hatch on top of the tank. Stocking Sloan's Lake in Lion's Park, Cheyenne, Wyo. This time, it's catfish -a fish Wyoming trades for trout from other states to give anglers variety. Wyoming mostly raises trout. 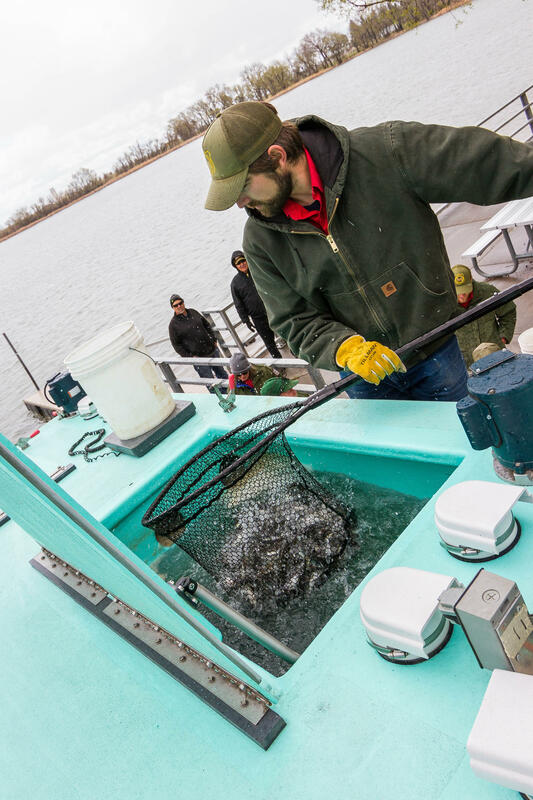 Members of the public often stop by while the fisheries staff stocks, says Sara M. DiRienzo of the Wyoming Game and Fish Department. Arthur strains backward to lift a netful of flopping fish out of the tank. Then he twists the net upside down. Trout – dozens of them - splatter into the pond. Scenes like this are playing out all over the Mountain West. 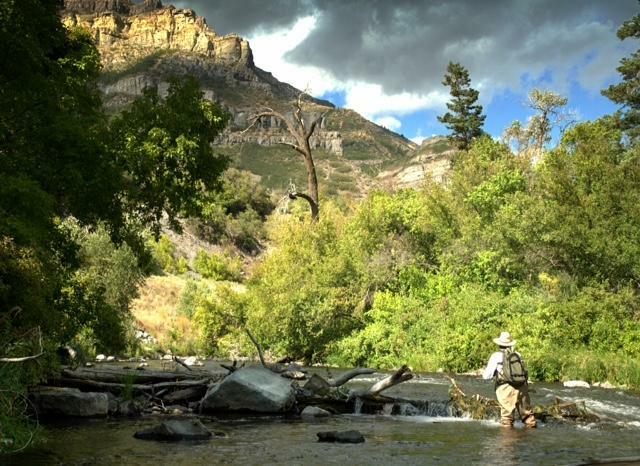 Wyoming, Colorado, Montana and Idaho – they also stock community fishing holes in the spring and summer. The conservation group, Trout Unlimited, supports programs like these. Fishing at a community park might not be fishing on a mountain river or the ocean, but it gets people excited about being outdoors. That’s exactly what’s happening at Willow Pond. The Cadenas are back on the fishing dock. Hanging out with friends and family, enjoying the natural world, advice about turning fishing into catching – it’s all here on an ordinary day at the neighborhood pond. And, without being preachy, it’s helping teach the value of a healthy environment. 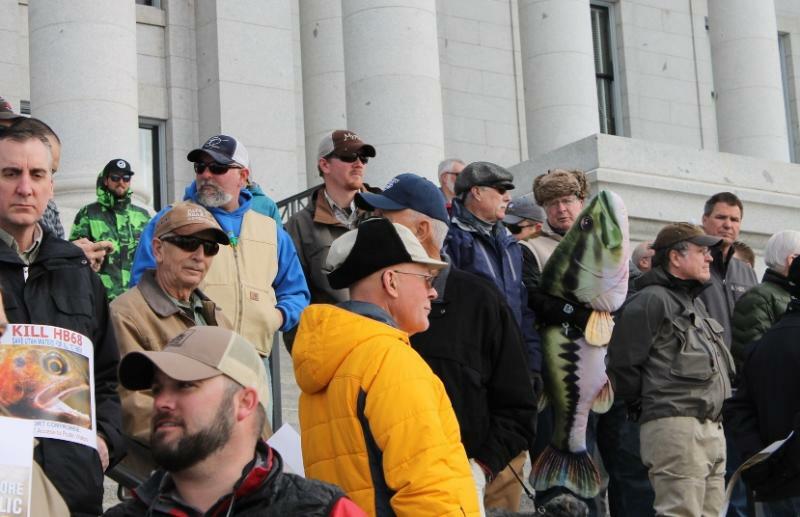 The battle over access to fishing streams in Utah probably won’t be resolved in this legislative session, but that was welcome news to anglers who brought the issue to the state capitol on Friday. About 400 people who had gathered on the capitol steps cheered the news that the sponsor of House Bill 68 will hold on to his bill for now. It would declare the state has met its obligations to keep streams open as a public trust. 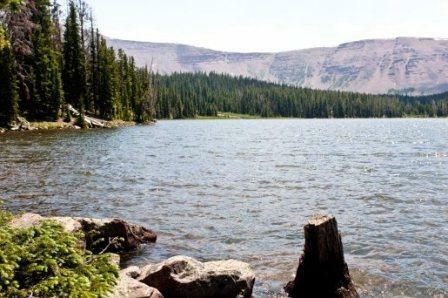 The Utah Division of Wildlife Resources is ready for the Colorado River Cutthroat Trout Restoration Project in the high Uinta Mountains. The project is scheduled for a couple of weeks after Labor Day along a stretch of the Sheep Creek drainage above the ten thousand foot level. The Utah DWR will be using rotenone to kill all of the non-native fish on the eight and half mile stretch of the streams and lakes, including brook, rainbow and Yellowstone cutthroat trout. Regional aquatics manager for the division Trina Hedrick says they’ve been waiting a long time for the right conditions. The group Trout Unlimited says the nation’s trout are in trouble. Development, invasive species and climate change are threats that have pushed the native trout to just one quarter of the places they used to thrive nationwide. TU’s president and CEO, Chris Wood, told reporters in a conference call Tuesday it’s not just a problem for people who like to fish.